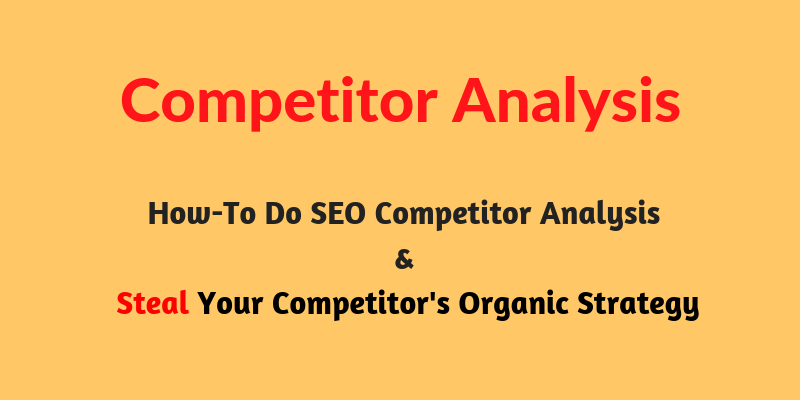 Competitor analysis is a crucial part of attracting traffic to your website. Before strategizing for your own business model, take a look at what your competitors are up to, i.e., what strategies are they utilizing to reach their target audience, for which keywords are they ranking higher? An insight into your competitor’s profile prepares you for the journey ahead. The truth is your competitors have a lot of information which you can utilize to improve your marketing efforts and skyrocket your website traffic. Let’s check out how you can use your competitors as a goldmine for your website. Before moving further with the process, let’s take a look at some of the online tools which are perfect for performing effective competitor analysis. These are the tools which we have tried in our years of experience and have witnessed considerably effective results. 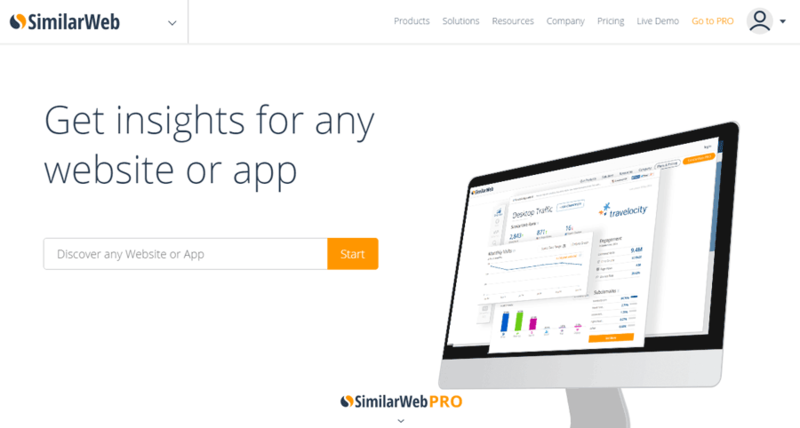 SimilarWeb is one of the widely used traffic estimation tools with tons of exciting features which allows you to get an insight into competitor’s profile. 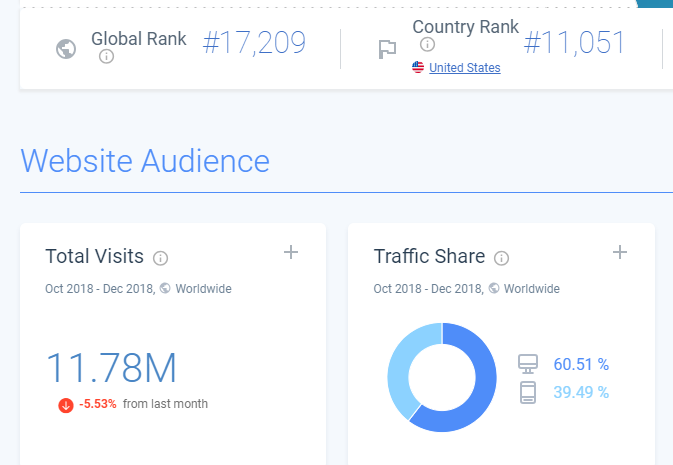 Using SimilarWeb, you can easily identify factors such as the source of traffic for the competitor, organic keywords, ad networks, and other competing websites. Ahrefs is another perfect analysis tool which you can use to check the competitor’s analytic report including the source of traffic as well as their backlink profile. Check which pages on your competitor’s website have brought in most of the traffic and which pages have the highest number of backlinks. You can also perform in-depth research on the link profile through Site Explorer (a crucial component of Ahrefs) in Ahrefs. Rival IQ is an online tool which lets you dig deeper into your own social media profiles and compare it with your competitors. You can compare social media post engagement, audience growth and your analytics for your top posts. Simply Measured can also be used to track your social media growth, specifically for your Facebook fan page. You can compare your analytic report to your competitor’s Facebook growth. The tool shows stats such as post engagement, % of fans who visited the post, etc. Now that you’re familiar with the analysis tools let’s start with the actual process of analyzing competitors. To help you along the way, we’ll discuss a hypothetical situation where we are about to start a new infographic design business and analyzing our potential competitors. Before starting with the process, we first need to identify all of our potential customers. One of the easiest ways to do so is to perform a Google search for our target keywords. If you already haven’t generated a list of target keywords, use Ahrefs or Google Keyword Planner to do so. However, if you have the list, you’re good to go. 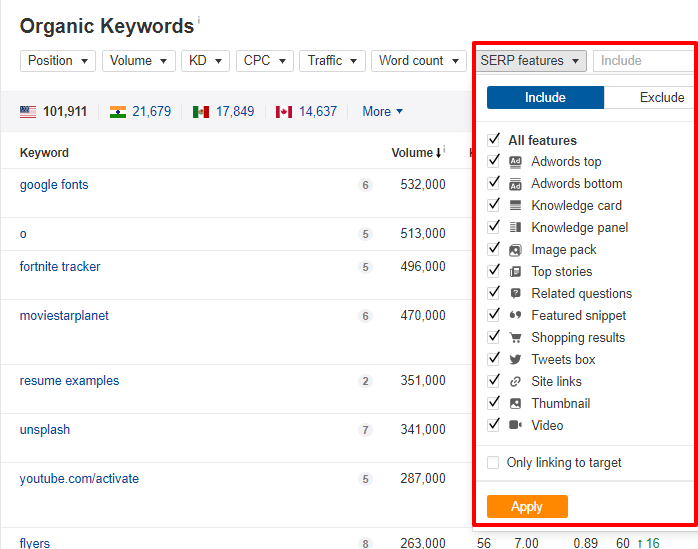 Since our “hypothetical” business is about infographics designing, we are likely to target keywords such as ‘infographic design tool’ and ‘infographic maker.’ Now, we can again take help from Ahrefs keyword explorer to have a deep insight into our keywords to find out their KD (keyword difficulty) and search volumes. While searching for the keyword ‘infographic maker’, Ahrefs’ content explorer spit out the following results. The keyword has enough search volume for us to focus on it to attract more traffic to our website. With the keyword difficulty of 72, it would be quite strenuous for us to rank for it. However, if we want to be the #1 in the infographic business, targeting this particular keyword makes complete sense. So here’s what we need to do. First and foremost, we need to find the competitors who are targeting the same keyword and are actually ranking for it. To do so, start with a simple Google search. These are the top three web pages which rank for our target keywords and they’re our potential competitors. So, we’ll add them to a spreadsheet to compare each of them individually. Now, that we have the list of competitors let’s pull out some basic stats for each competitor. Start out with comparing each of the competitor domain to pull out some basic stats like referring domain and domain authority. To do so open up the Domain Comparison Tool in Ahrefs. You can even compare up to five domains at once using the tool, which makes it extremely powerful and convenient. We will receive a ton of stats for the domains. However, we only need to compare the domain rating and the number of referring domains each website has. Having a higher DR means that the particular website is one of the high authority domain and therefore is likely to have a strong backlink profile, i.e., high-quality backlinks. The strong DR can either be due to high organic reach or due to an effective link building strategy. However, whichever the reason is, we’ll figure that out later in the process. As of now, we need to copy these stats (i.e. Domain Rating and Referring Domains) in our spreadsheet. 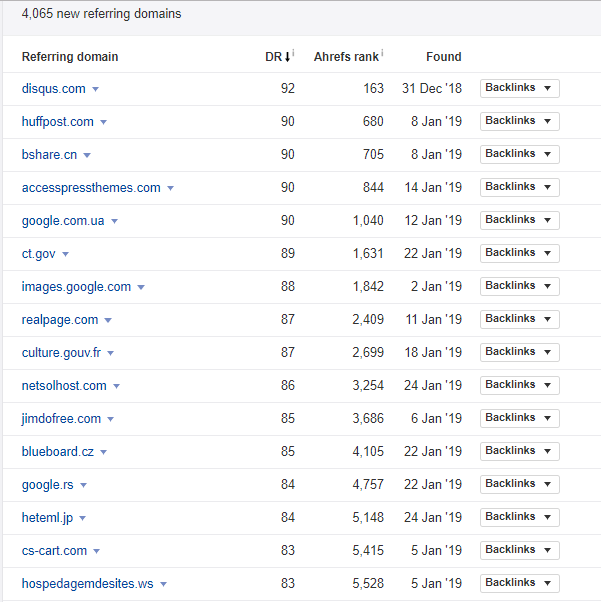 As you can clearly see that all our competitors have a decent number of referring domains and a high domain rating, which might become a concern for us. Identifying these stats is significantly crucial mainly because they tell you what you’re against. A website having a strong DR is likely to be in the business for a while now, which means it has a large backlink profile and better search engine rankings too. It basically means that when you will target the same keyword like such a competitor, you’re likely to be ranked lower due to their higher DR score. This is one of the biggest challenges for every new website, especially when their competitor has a significantly higher Domain Rating. However, studies have shown that websites with better DR can be outranked as well simply by building backlinks to individual web pages. So, if your website is new, don’t get anxious seeing the strong DR of your competitors. Focus on acquiring better backlinks to the web pages that you want to rank for and improve your DR score. The minute your DR score increases, your search engine rankings will improve, which will eventually lead to increased website traffic. One thing that you should remember about DR is that when you start to achieve better Domain Rating, it would become relatively difficult to improve it further. It means that it would take more time and efforts to go from DR40 to DR50 than it took to go from DR20 to DR30. It also means that a website with DR60 isn’t twice as authorized as a DR30 domain but way more than that. Another thing that you should remember about Domain Rating is that a higher DR has more potential to naturally attract backlinks, which can further lead to better search engine rankings. The next thing that you should remember is that the rate with which each domain is acquiring new domains per month. Reason being, you need to acquire more referring domains than your competitors each month. So, if your competitors are acquiring 100 referring domains every month, you need to surpass this benchmark. Site Explorer > Enter domain > Explore > Referring domains > New > Set custom period > Show New referring domains. As you can clearly see that piktochart.com acquired almost 4,000 new referring domains in just one month. We’ll find out the new referring domains for each of our competitors and add the results in our spreadsheet. It’s also crucial to compare the Link Acquisition curve for each of the competitors to check whether they acquired they experienced a sudden hike in the link growth or have been acquiring links at a consistent rate. You can use the ‘Referring Domain Graph’ to check the link acquisition curve for each of the domains. Here’s the referring domain graph for Canva.com, one of the leading competitors for our hypothetical business. As you can see that Canva has been acquiring links at a consistent rate for the last three years. However, when we generated the same graph for piktochart.com, the results were a bit different. Piktochart has witnessed a hike, very minor though, in the link acquisition rate in the past one year (i.e. from Jan 2018 to Jan 2019). This has resulted in better Domain Rating as well as better search engine rankings. This sudden hike is likely to have increased the website traffic for Piktochart as well. However, the real question that we should ask yourself is why Piktochart experienced a sudden hike out of the blue? This could happen due to many reasons, an active SEO campaign being one of them. 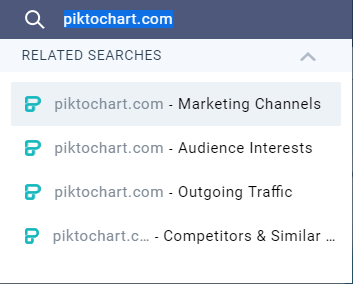 It is possible that Piktochart has improved their SEO strategies in the past year and have optimized their previous SEO campaigns. At this point, we would probably head back to the ‘New Referring Domain’ report for Piktochart to have in-depth insight into the backlink acquisition for the website. If you end up finding similar competitors which experienced a sudden hike in their link acquisition graph, we recommend exporting the new referring-domain report for further reference and analysis. There’s no arguing the fact that backlinks remain one of the biggest and most crucial search engine ranking factors. So, when you understand the rate at which your competitors are acquiring backlinks, you know what your target should be. It simply means that you should always aim for achieving better link acquisition rate than your competitors to achieve better search engine rankings and improved website traffic. Since we have picked a potentially competitive niche for our hypothetical business, the link acquisition rate for our competitors is significantly higher. In other niches, however, you’re likely to find a lower number of referring domains and lower link acquisition rate as well. Now, that we’re familiar with our competitors and the basic metrics for their website, it’s time to take a look at their website traffic. Here are the key points that we need to find out. From Where Our Competitors are Getting Traffic. The Countries Which Provide Them Traffic. For traffic analysis, we are going to shift from Ahrefs to SimilarWeb for having a better traffic analysis. We’ll take a look at the traffic report for one of our major competitors, i.e., Piktochart.com. Start with entering the domain name into the search box the top of the home page of SimilarWeb. Here’s a simple overview of the website. However, for a better traffic understanding, we would like to dig deeper and have a better insight into the traffic report for the website. The Traffic Sources for the Competitor? Now, you can also use a simple and free tool like Google Analytics to find out the traffic sources for your competitor, but it’s better to rely on a professional tool like SimilarWeb for better results. 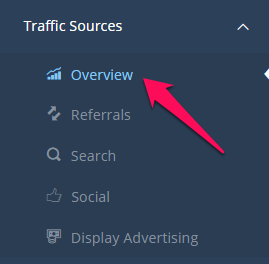 Click on the overview button under the Traffic Sources tab in SimilarWeb to pull out the stats for traffic sources for the competitor website. This will display the percentage of traffic generated through each of the channels. Along with this, you’ll also get a chart for traffic volume from each of these channels. Here you can see that the “Social” channel is the combined percentage of all the social media profiles. So, if you want to get the platform-wise traffic percentage, click on ‘Social’ to check which social media platform is generating what percentage of traffic. The reason why you need to identify the source of traffic for your competitors is that it will tell you the traffic channel that you should primarily target. For instance, some niches like Buzzfeed.com are likely to get most of their traffic from a social media platform. So, if you are launching a brand new business that revolves around publishing space, you’re likely to focus on improving your social media strategy efforts to attract your social media audience. Similarly, other niches may get most of their traffic from organic searches only. In this case, you should focus on improving your search engine rankings to rank in the top results of SERP. It is clear that traffic sources vary from niche to niche. Therefore, analyzing the traffic sources for your competitors will help you understand which source should you target for your website. We should improve our search engine rankings to acquire new customers directly from search engines. Marketing our brand to get that referral traffic. We should also focus on identifying the referral traffic for our competitors to check which sites are providing most of the referrals. Which Websites Provide the Most Referrals? The next thing that we should take a look at is the website which provides the referrals to our competitor website. This can easily be done using SimilarWeb. 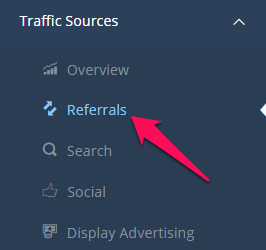 All you have to do is generate the Referral report by clicking on the ‘Traffic Sources’ Tab. For every new website, it is crucial to focus on building quality backlinks from high authority domains. However, what’s better than building quality backlinks? Acquiring links that actually drive traffic to your website. Since your end goal is to increase your website traffic, it makes complete sense to focus on building links that are driving referral traffic to your website. Apart from boosting the website traffic, these referral websites will help you get the most out of your SEO efforts, leading to better search engine rankings. That’s the reason why you should identify the websites which provide referral traffic to the competitor website. From the traffic channel report, it is clear that our competitors generate almost 25% of the traffic from referrals. However, it is crucial to understand whether these referrals are coming from natural links acquired through strategies like Blogger Outreach or are they coming from some sort of affiliate marketing? One thing that’s clear from the above report is that Creativebloq.com is the #1 source of referral traffic to all the three competitors. So, it’s crucial to take a look at the backlinks. Now, we can get back to using Ahrefs to take a look at the backlinks. Once we started to dig deeper, we understood that all these links are general refers and not a result of any affiliate partnership. Furthermore, the reason why the referral traffic is so high is that all these web pages have a considerably huge organic traffic. The first two referring web pages were getting almost 40,000 combine organic visits per month. It simply means that we should focus on building relationships with Creativebloq.com to acquire backlink from them and get that whooping referral traffic on our website too. It is also clear that the reports generated earlier by SimilarWeb.com (%age of traffic from each channel) were precisely accurate. Therefore, it’s worth investing in a tool like SimilarWeb for better analysis. The next thing that we should identify is the Countries that Provide Traffic to our Competitors. The Countries Which Generate Traffic for Our Competitors. To take a look at the countries that drive most of the traffic to competitor’s website, click on the ‘Geography’ button under ‘Website Audience’ tab. Here are the top five countries that drive traffic for Piktochart.com. 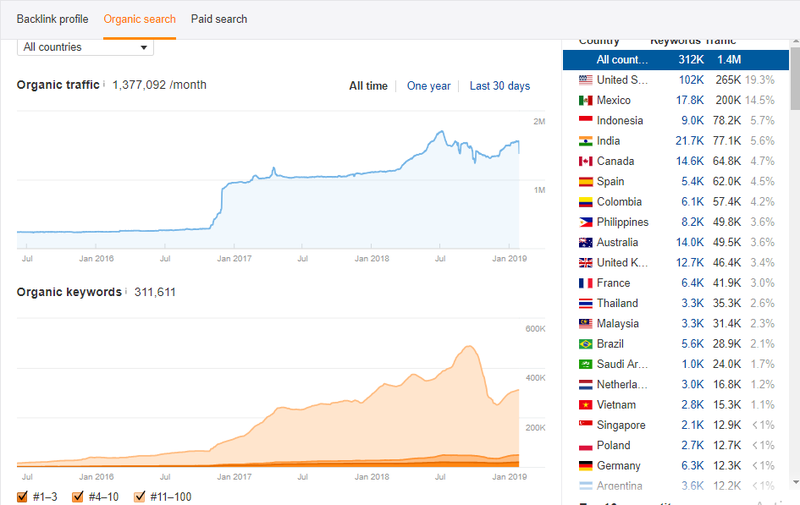 One thing that you should remember is that the free version of SimilarWeb only displays up to five countries and if you want to expand that list, you’ll have to upgrade to the pro account. From the snippet, it is clear that our website generates a decent amount of traffic from both the United States and Mexico. It means that whatever strategies we build to grow our business, they need to focus on targeting customers from these two locations. Furthermore, it’s worth taking a look at some other site metrics and compare them with each other. Since it may get a little strenuous for you to individually analyze the metrics for each website, it is better to use the compare feature in SimilarWeb to compare the stats for each website side-by-side. Now, the free versions only let you compare two websites at a time. So, if you want to compare all of your potential competitors, you should upgrade to the pro version. As of now, we’ll compare our two competitors only and manually pull the third’s stats using the site-overview feature of SimilarWeb. Scroll down to the Engagement section under Website Audience tab and take a look at some of the basic comparison metrics such bounce rate, monthly visits, unique visitors, etc. Fill up this information in the spreadsheet to enhance the competitor analysis report. We have manually pulled out these metrics for our third competitor, i.e., Venngage.com. This is how the report looks now. Since we have compared several metrics, it’s worth individually explaining each one of them. When we take a look at the monthly visits for each website, we get a rough idea about the overall traffic opportunity the particular niche has. It’s worth noting because it tells us how much traffic should we expect and achieve in a specific amount of time. Furthermore, we also know which of our competitor receives the most of the traffic. Bounce rate is a crucial metrics for each website. A bounce happens when a user opens up a web page on a website and closes it. So, if a website has a higher bounce rate, it means that the users aren’t exactly finding anything valuable on the website. It’s worth noting that higher bounce rate can even lower the search engine rankings too. These are the average number of web pages users navigate through on your website, during their visit. Higher values of Pages/Visit means that the website is providing the users with valuable and engaging content. Let’s once again get back to using Ahrefs for performing organic traffic analysis for our competitors. The eventual goal for our hypothetical business is to drive organic traffic to our website. So, it makes complete sense at what strategies our competitors rare utilizing to the same for their website. We’ll use Ahrefs Site Explorer to perform Organic traffic analysis for each of our competitors. We are already familiar with the average organic web traffic for the competitors. 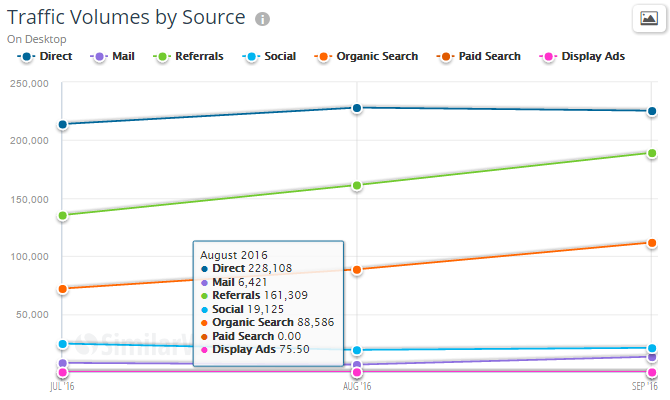 However, we need to dive deeper to have a better insight into organic traffic figures. Total organic Traffic Per Month. Once we have an overview of the organic traffic for each of the competitors, we would want to identify the keywords which are bringing this organic traffic to their website. This can be done by generating the Organic Keywords report in Ahrefs. Simply click on the organic keyword button under Organic Search tab in the mid-left corner of Ahrefs. In the above snippet, it is clear that Piktochart is ranking for a total of 101,911 keywords in the United States. 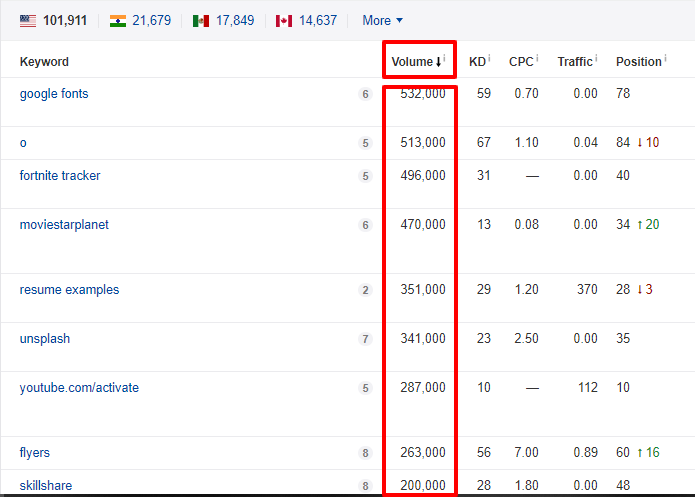 Now, you can also sort this report by their total search volume to figure out the most potential keywords having the large search volumes. Simply click on the volume button and the list will automatically get sorted by search volume. 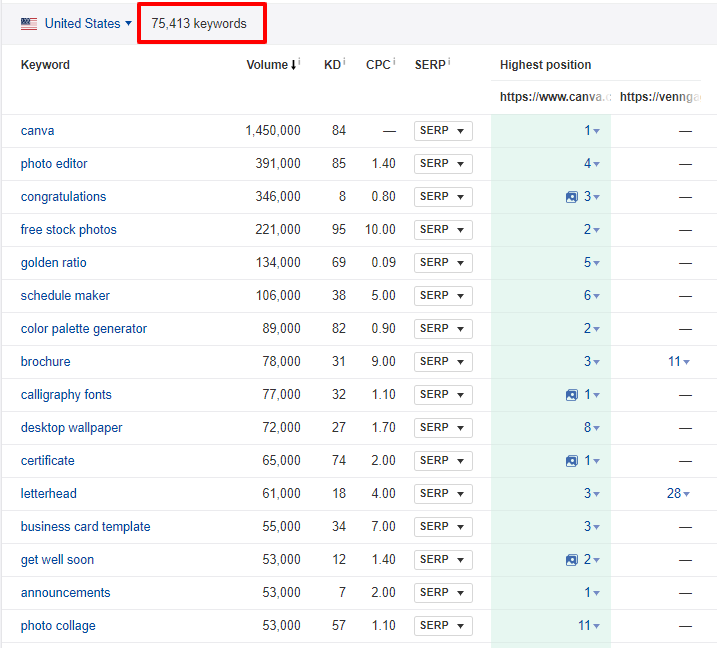 These large search volumes may excite you for a minute but it’s worth taking a look at the Keyword Difficulty (KD) for each keyword as well. Keywords can have a huge number of average search volumes, but if their KD is higher, it would be considerably difficult for you to rank for such keywords. It basically means that the larger the KD is, the more backlinks would be required to rank in the top results. You can also use Ahrefs Keyword Explorer tool to get an estimated number of backlinks you’d need to rank for a certain keyword. 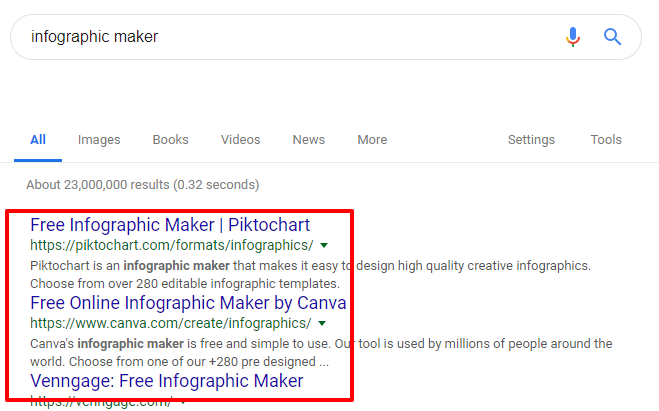 For instance, the keyword “infographic maker” with a keyword difficulty of 72 will require backlinks from 224 domains to rank in the top 10 positions on the SERP. If you end up falling in similar situations, make sure that you are utilizing effective link building strategies otherwise it’s worth targeting keywords with lower KD. Another thing that you should remember while analyzing competitor’s organic traffic is that the SERP features your competitors rank for. SERP features are basically the search results on search engine page which is not an organic result. For instance, Ads, Featured Snippets, Related Questions, etc. In the past few years, the number of SERP features have rapidly increased. So, it’s worth noting the features for which your competitors are being ranked. 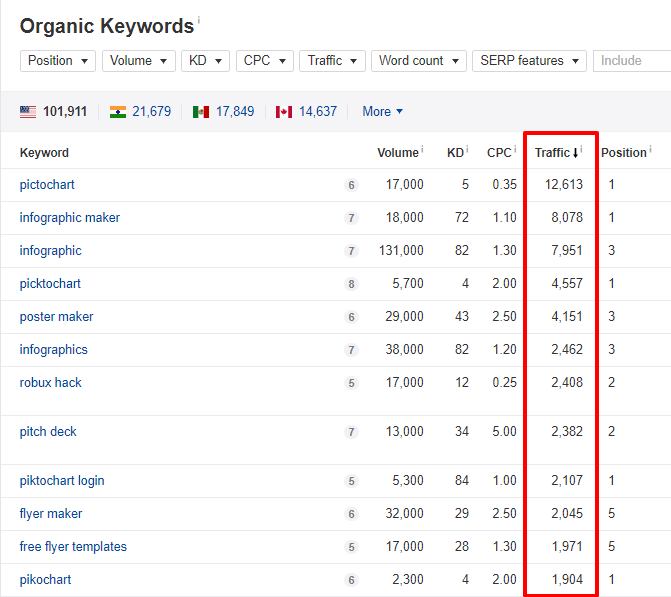 You can again use the Organic Keywords Report to find out which SERP features your competitors occupy while ranking for a certain keyword. Simply apply the SERP features filter to the organic keyword report. You can either click on ‘All Features’ or pick individual features to get personalized results. What’s a content gap and why do you need to fill it? Content gap basically means the keyword for which your competitors rank for but you don’t. Finding such keywords is a big relief as it gives you better content opportunities as well as improve the organic traffic by boosting up the search engine rankings. The good news is you can easily find such keywords using Ahrefs ‘Content Gap’ tools to find these content gaps. 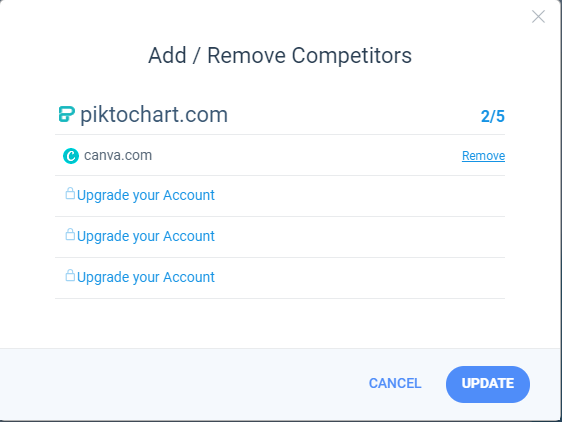 Since we don’t have a domain to compare to our competitors, we’ll compare one of the competitor domain (Piktochart.com) with the rest of the competitors. 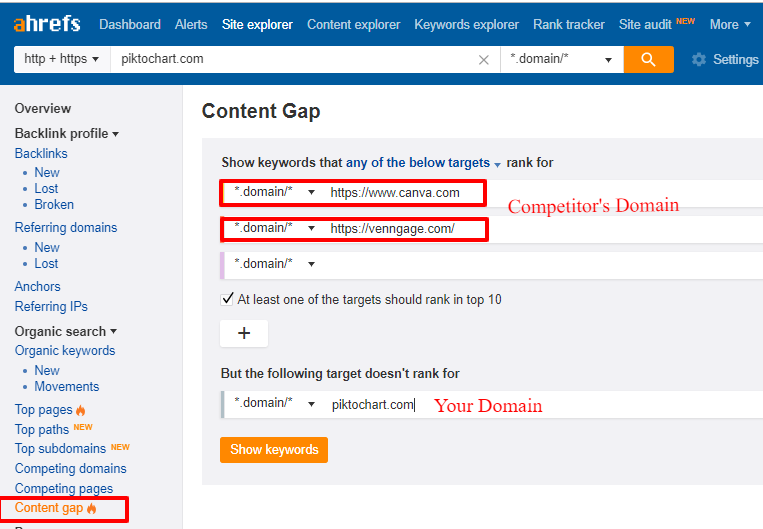 Click on the Content Gap button in Ahrefs Site Explorer and enter the list of competitor domains. Note: Do remember to check the box after entering the competitor domains to ensure that one of the competitors should rank for the displayed keywords in the top 10 positions. Here’s the generated content gap report. As you can see that we have almost 75,000 keyword opportunities which we can target to achieve better search engine rankings. If your website is new, you should target keywords having low difficulty and higher search volume. Reason being it would be much easier to rank for low difficulty keywords and the higher search volume means it would be easier to attract search engine traffic to your website. Content having Highest Organic Traffic (Most Popular Content). Content with Huge Number of Shares. We’ll again use Ahrefs Site Explorer to analyze the content of our competitors. We can easily identify the competitor’s most visited content using the by clicking on the ‘Top Pages’ button in the Site Explorer. Since we only want to analyze the blogs posted on the website, there’s no point in exploring the entire domain. SO, simply paste the URL for competitor’s blog page in the Site Explorer and hit enter. Here’s how the Top Pages report looks like for the Piktochart blog page. As you can see that Piktochart’s top content is about Startup Pitch Decks. The particular post has a whopping 7,138 organic search visits per month and is ranking for 1,579 keywords. We can also view the individual keywords that the particular page is ranking for. SImply click on the keyword column and it will display a list of keywords that the page is targeting. The Importance of Top Page Report. Unlike the good old days of SEO, Google has become way smarter in understanding content. It means that you cannot simply target 100 keywords, create a blog post for every keyword, and expect to achieve better search engine rankings. The truth is you can even rank for thousands of keywords within a single post even if you haven’t mentioned the keyword once in your post. All you have to do is optimize your content for related keywords and Google will automatically rank you in the top rankings. A great example of this is the keyword “Guest Posting”. 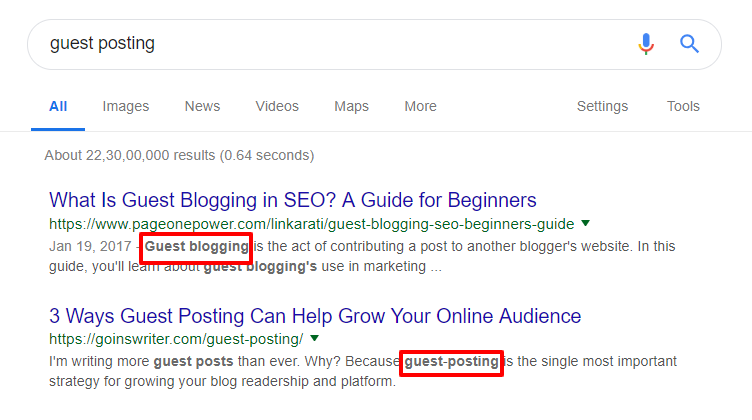 Since Google knows that Guest Posting also means Guest blogging, it will rank your web pages for both the keyword even if you have only targeted Guest Posting within your post. 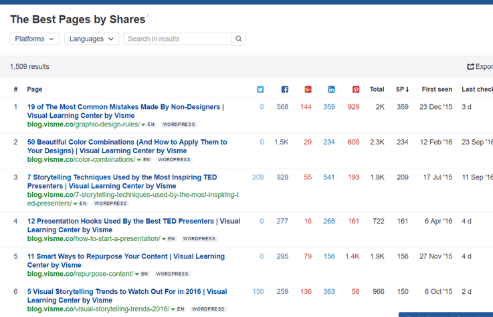 So, you can use the Top Page report to find top content of your competitors. It will help you identify content opportunities with potential keywords and utilize them to improve your organic traffic. With competitor’s top content, all you have to do is replicate those articles while making sure they’re have the uniqueness factor and skyrocket your search engine rankings. Now, we should move further to finding competitor’s content with most backlinks. To do so we’ll use the Ahrefs “Best By Links” feature and sort the content by the number of backlinks. Enter the competitor’s blog page URL in Ahrefs Site Explorer and click on the Best by Links button under Organic Search tab. 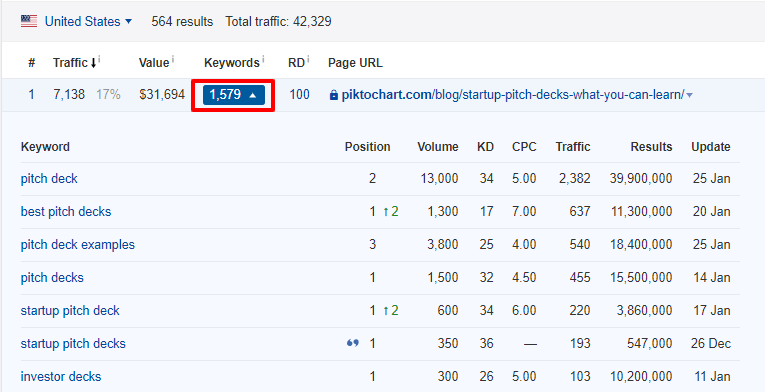 As you can see the same post (Startup Pitch Decks) has backlinks from 34 referring domains. Furthermore, the other posts also have a huge number of backlinks. For instance, the second result in the list has backlinks from 31 referring domains, which is a huge deal. As we have mentioned several times it is extremely crucial to have a strong backlinks profile for your website. You can consider backlinks as the footprints for your web pages on other websites from where readers can land on your website and increase your web traffic. However, the real question is how should you create backlinks? The answer’s pretty simple, use your competitor’s backlink profile to acquire links to your own domain. Since these domains were happy to link to your competitor’s web pages, they won’t hesitate in linking to yours too. All you have to do is write better content and approach them to link your website. To find the websites which are linking to your competitor’s web pages, click on the Referring Domain column in front of any post in the Best By Link report. This will display a list of websites linking to the particular web page. Looks like our competitors were generous enough to draft the entire list of domains for us. While analyzing competitor’s content, it’s worth checking the type of content that’s bringing significant results. For instance, while in some niche, the target audience likes infographics and visual content, the other niche may completely rely on text-based content to attract website traffic. Whichever the content type is, it is imperative to put your efforts into creating a similar type of content which has the potential to allure your target audience. You should also pay attention to the content which is missing from your niche but is likely to allure your target audience. So, if you create such content, your brand will stand out in the market. Many websites rely on social media platforms to improve their web traffic. The truth is social media has the potential to skyrocket your website traffic and grow your business. So, it’s crucial to find out the competitor’s content that received most shares across various social media platforms. To do so, we’ll generate the ‘Best by Shares’ report in Ahrefs site explorer. Simply click on the Best by Shares button under Organic Search tab. As you can see that some of the posts have even received 1500 Facebook shares. It means that targeting specific keywords and writing on a certain topic can exponentially boost up your website traffic. The tips that we shared above help you to do a thorough analysis of your competitor’s strategy that they are using to generate tons of organic traffic to their website else you can hire a SEO Experts Company India and let them analyze the website to find its flaws and optimize it to improve the website performance.